How To Create A Rental Agreement In Bihar? Bihar, the historically and culturally rich center is the place where the world’s oldest university, Nalanda University, came into existence. The state hasn’t always been in a state of stagnancy, for many forces, social and political are reckoning over the brilliant potential the State has. It is lately, under the watchful eyes of many leaders, growing up to see a wealth of reforms, for with increasing population there will be a rise in demand for jobs and evidently a boom in the realty sector. 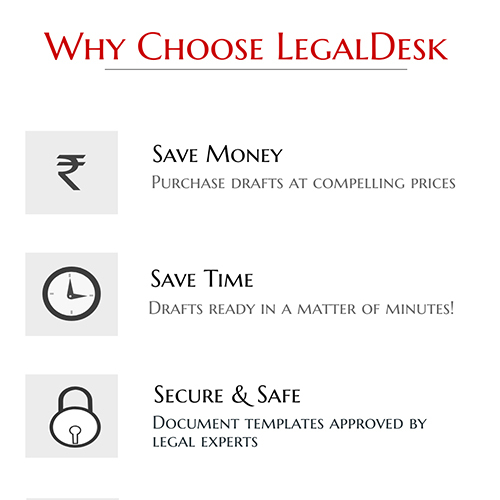 To harness this boom we, here at LegalDesk, provide pre-drafted legally valid templates of various legally documents including Rental Agreements. For every growing economy like Bihar, one can never miss the widening opportunities in the form of new investments and the development of realty sector. And one perfect ingredient to make things not only efficient but time saving, if in the property managing business, is the prudent use of technology like the one we provide as today we all live life in the fast lane! If you’ve found the Tenant or Landlord you’ve been looking for and are proceeding towards sealing it with an agreement, start with using our portal to create a Rental Agreement. With the first step, you’ve practically skipped the visit to a lawyer besides saving some time and money. Discuss the clauses that should go into the agreement in addition to the repetitive or basic clauses already in place. Download the draft from our website or have the Rental Agreement printed on a Stamp Paper of a suitable denomination and delivered to your doorstep. If the former, procure the Stamp paper from the nearest Sub-Registrar office and print the downloaded document on the Stamp Paper. Have the Landlord and the Tenant sign the document in the presence of two witnesses. If required (mostly recommended), register the Rental Agreement at the Sub-Registrar office. What Goes Into A Rental Agreement? 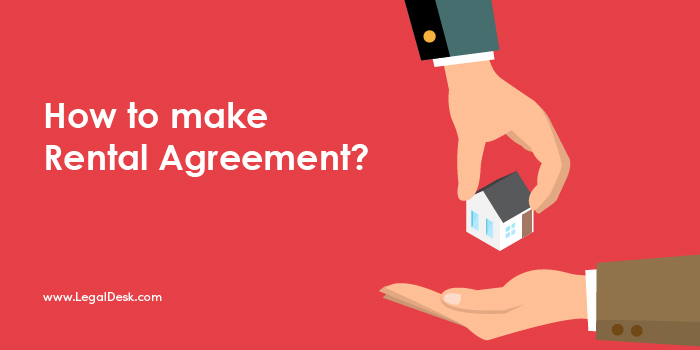 Apart from specifying the details of the parties engaging in the agreement, it also entails the general clauses which are common to all Rental Agreements. Bonafide Landlord/Tenant: Before entering into an agreement, while filling up the addresses of the parties make sure they are entered rightly. Rent Payment: It is up to the Landlord to fix the monthly rent payment. Lease Term: The term of the lease should be agreed upon by arriving at a consensus between the parties. Notice Period: The duration before which the Tenant should notify the Landlord on leaving the premises should be agreed upon. Maintenance Fees: Apart from the monthly rent, the additional payment to be made for security, garbage disposal, and Home maid services mostly on a monthly basis should be agreed upon too. Pet Rules: Since not all Landlords allow pets, it is wiser to add this clause in your Agreement. Once the Rental Agreement is formed with the attestation, Registration is optional and mostly depends on the type of Rental Agreement. For most Commercial Lease Agreements, Registration is a must for it involves larger sum of money and also a greater risk due to lack of transparency. And at the same time it is recommended for a Long term Lease too, for when you register your Rental Agreement, there is a sureness and a sense of security that comes with it, for there is less probability of a fraud altogether. Notarization primarily ensures the genuinity of the parties getting into an Agreement. The right to attest a Notarized document is given to a Notary officer, appointed by the Government. A Notarized document is “a document with an authentic signature(s) of the person(s) authorised or required to sign it, and the signature of a Notary Public witnessing the signing of the document, accompanied by an impression of his or her official notary seal.” Notarization mostly is a skipped process since one can always Register the Rental Agreement, for that is the primary necessity in the event of a legal dispute. Nevertheless, Notarization is recommended for Commercial Lease Agreements as it involves business enterprises. For further queries about Notarization you can refer to our website. 11-Month Tenancy Agreement: It is the most common type of Rental Agreement where Registration can be usually skipped since it is the longest without mandatory registration. As the end of the agreement approaches the agreement can be renewed. Commercial Lease: It is the type of Agreement signed almost exclusively among Business enterprises or between a Landlord and a Business. Because the procedure and the formalities that entails the formation of a Commercial Lease Agreement are normally different from the Tenancy Agreements, both Notarization and Registration are recommended. Long-Term Lease: Generally exceeding the duration of a half a decade, it involves large sum of money and registration is highly recommended. Also Long-term leases always have the Tenant pay a large yearly-wise sum of money, which is returned to Tenant by the Landlord at the termination of the Agreement. Ever since the circulation of e-Stamps has increased in different parts of India, the trend of making online Rental Agreements is only growing. It has seen tremendous amount of development, for now a state doesn’t necessarily have to produce e-stamps for you create online draft of your Rental Agreements. It is now a simple, hassle-free procedure where at ones home you can customize a legally valid, Tenancy Agreement. Read on to these following simple steps to prepare a Rental Agreement. Select the type of Rental Agreement suiting your needs. Enter the various details required to be filled, the names and addresses of Landlord and the Tenant. If not satisfied with the already given clauses, add your own to the already existing ones. Download and print the document on a suitable Stamp Paper. Get the document attested or have it registered at the local Sub-Registrar office, if required. Please note that this is not mandatory. Traditional processes to create a Rental Agreement will leave you struggling to find the perfect lawyer you can find a rapport with, which is only a part of the problem for you must endure the inconvenience of fixing reasonable prices and appointments. Instead, draft your Rental Agreement sitting at home and make the required customisations. So, wait no more and start making your rental agreement NOW! There are 2 comments on "Rental Agreement In Bihar".